Blackberry ice cream is my favorite ice cream made at home (so far). This recipe calls for blackberries, but boysenberries, olallieberries or raspberries would prolly work, being similar fruits. 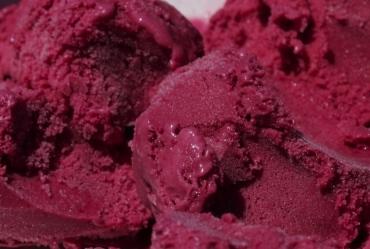 The deep magenta color is enough to confuse this ice cream for a sorbet! I haven’t tried this with frozen berries, yet. Some similar fruits are hard to find fresh, like mulberries, so I’d love to hear how this recipe would work (or what would need to change) using frozen fruit. Update (28 July 2013): I’ve increased the amount of egg yolks to 3, in order to avoid further curdling issues with very acidic batches of berries. Speaking of which, this recipe goes very well with raspberries, although I really needed to jack up the amount of sugar due to extreme tartness. Update (13 July 2008): Don’t use half-and-half. I had naïvely thought that it had half the fat content of heavy whipping cream. Wrong! The result: mixing in the acidic berry sauce causes the custard to curdle because there isn’t enough fat to protect the milk’s proteins. Mathematics indicates 3g fat (div) 30ml = 10% per serving of half-and-half. But if you mix whole milk (3.5% to 4% fat) with heavy cream (36% to 38%), that’s at least 19.75% fat, nearly twice as much as half and half! The frozen result was actually passable in that the curds weren’t noticeable, although it wasn’t as creamy as when it’s made with cream and milk. In any case, I’m going to update my other ice cream recipes by removing the usage of half-and-half. Place the blackberries, sugar and lemon juice, if using, in a non-reactive sauce pan and bring to a gentle simmer. Stir occasionally and simmer until the berries become pulpy and liquidy. This could take anywhere from 5 to 20 minutes, depending on their ripeness. Sometimes I help them along by gently mushing the berries with a potato masher. Set aside to cool. In another sauce pan, bring the cream, milk, sugar (or vanilla sugar) and salt to a simmer. Turn off the heat. Temper the egg yolks by slowly pouring (in a thin stream) a ladle or two of the hot cream mixture, mixing quickly with a whisk. Pour the egg mixture into the sauce pan with the cream. Turn on the heat again, this time to medium low. Whisk until it becomes a custard: Test by either temperature (170F to 175F degrees) or spoon method (coats spoon and a line drawn through doesn’t droop). Remove from heat. Using a strainer, filter the blackberry sauce (to remove the pips) into the custard. It’s okay if tiny berry skin bits get in. Stir well and store in the refrigerator for at least 6 hours, until cold, preferably overnight. Prepare according to your ice cream maker’s instructions. To avoid custard skin and vanilla bean bits (if using vanilla sugar), pour the custard through a strainer (again), directly into the ice cream maker. I use the Cuisinart ICE Automatic with the gel canister, which should be chilled beforehand for at least 36 hours. It usually takes 25 to 30 minutes to churn. You should still keep an eye on it near the end, to avoid overbeating it. This should yield just over 1 quart. Scoop the ice cream into a storage container, then place it in the freezer for an hour or two to firm up before serving. This was written by sairuh. Posted on Friday, July 20, 2007, at 11:48 am. Filed under Food. Tagged ice cream, recipe. Bookmark the permalink. Follow comments here with the RSS feed. Post a comment or leave a trackback. These last two ice cream recipes sound great. I use similar methods for homemade ice cream and I agree, fresh fruit is the best way to enjoy ice cream. Have you experimented much with other sweeteners (ie:honey,maple syrup, brown sugar)? Hi Mike, the suggestion of using alternative sweeteners sounds really interesting! I haven’t tried those yet. I wonder how dried maple sugar would work; perhaps using the syrup might make the custard too watery? I’ve seen honey used in some recipes: Mercedes of Desert Candy has a yummy sounding one.